Intercom is a live messaging app that makes it easy to personally communicate with them through email, in-app, and web messages. If you talked to the Livestorm team via our chat then you have already used Intercom. Why Connect Livestorm and Intercom? 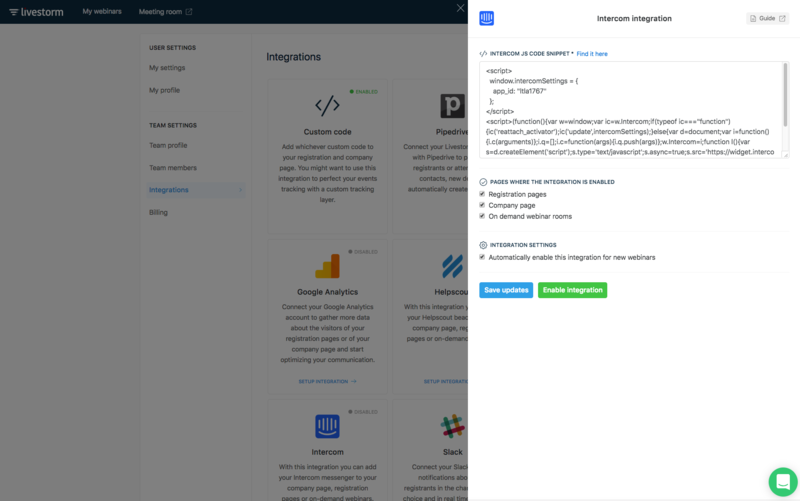 By connecting Livestorm and Intercom together, you can add your Intercom tag to Livestorm registration pages, your company page and on-demand webinar rooms. This is useful if you want to reach out to visitors on those specific platforms with your own live chat. You can talk via the Intercom app with prospects not only on your website but also on Livestorm. This is useful if they have questions about your webinar, your company or just need some help. It has shown a significant positive impact on registration conversion rates.